There are many facebook groups/profiles created about the Avengers. 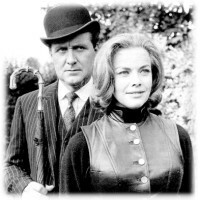 There's a profile for John Steed, several for Emma Peel, a profile for Tara King, for Cathy Gale (that's me), for Purdey (that's me as well) and one for Mike Gambit. I don't know if there are many people here on facebook..
Also a number of groups have been created about the Avengers and there are also a few groups dedicated to Diana Rigg. So now I've made a group dedicated to Honor Blackman. You can only access it if you have Facebook though.. Very original, as if we were inside of the series.